A hot day, and sheep lie panting in the shade, each covered in an insulating blanket of wool. Does a ewe remember last year’s clipping, and the lightness of being? Does she long for the same to happen again? Who knows what goes on inside a sheep’s head. Wool is a fascinating natural material, a material scientist’s dream: it’s water-proof, strong, flexible and has good insulating properties. If you look at the 60-plus different breeds of sheep throughout the UK you can see that the structure and appearance of their fleeces differs markedly. In New Zealand in 2004, Shrek the Merino sheep was finally captured; he had been living wild for 6 years and his fleece had grown to such monstrous size that the woman who found him said he ‘looked like a biblical beast’ – 27 kilograms of matted wool were taken off him when he was clipped. Merino wool is normally highly prized because it is white and thus easily dyed, and the fibres are soft, long and very wearable. You definitely wouldn’t want to wear a Herdwick pullover, though: the wool of this ancient breed found in the English Lake District is like the wire-wool used in pan-scrubbers – thick, coarse and with short fibres, its colour ranging from black through greys to white. I keep a few Herdwicks myself, and very early became fascinated by their fleeces (as well as their anarchic and escapologist tendencies – they are not stupid animals). I learnt how to ‘skirt’ and wash a fleece and how to card it to align the fibres, preparatory to using the wool for weaving. I also learnt how to unalign the fibres of dyed and carded ‘tops’ in order to felt the wool – making a material with entirely different properties. Wool fibres, produced like our own hair from specialised skin cells, are hollow and covered in minute scales – these structures give them their water-proofing and insulating properties. Felting occurs when the fibres are pummelled in hot soapy water or with a barbed felting needle, causing the scales on adjoining fibres to interlock and bind the fibres into a tight meshwork; if you have made the mistake of putting a woollen pullover into the washing-machine, you will know exactly what I mean. I weave using wool from a wide variety of breeds, enjoying the different colours and textures (see www.annlingard.com/weaving/gallery), but of the many rugs I have made, a large rectangular rug, Mother and Daughter – ’tiles’ of blackish-brown and pale grey wool – remains my favourite. When a Herdwick lamb is born it’s usually black all over but by the autumn its face and legs have turned white, and within 18 months its fleece is becoming the characteristic bluish-grey: the lambs are dark, their mothers have gone grey. Environmental factors such as day-length switch off one of the genes that cause the fur of arctic foxes to turn white in winter – does a similar factor switch the genes in sheep? Most research on coat-colour has been done on animals like mice and shows that a complicated set of molecular signals turns colour-affecting genes on or off, or causes the colour-forming cells to move to different areas of the embryo’s skin. There are recessive and dominant forms of some of the controlling genes. In Merino sheep like Shrek, white is dominant, black is recessive. In the skin cells of the occasional black Merino the gene for ‘Agouti signalling protein’ (ASP) has been switched off. ASP stops the production of melanocytes (skin cells which make the black pigment, melanin), so if there’s no ASP, there are more melanocytes in the follicles that make the hairs – and thus more melanin. Hence black sheep. Something interesting is happening in Herdwicks as the sheep mature: perhaps the genes which are involved in making the black pigment melanin have been switched off in some of the hair-follicle cells, or perhaps ASP has been switched on. And it happens much earlier in the skin on the face and legs than on the rest of the body. Perhaps, by September, scientists in Edinburgh might have some answers. A sheep-breeder looks for good ‘conformation’ or shape, a butcher checks for meaty haunches, a wool-buyer wants to feel the quality of the fleece – and someone who keeps sheep as lawn-mowers might just be looking for an animal ‘with a nice face’. All these qualities are regulated by the sheep’s genes and can be selected for by breeding. Sheep-farmers can select for fleece colour and pattern, and they can also select, to a limited extent, for wool quality – finer, or stronger, or longer fibres. But wool quality is also influenced by environmental factors, especially nutrition. Poor nutrition means that the growth of wool fibres is temporarily halted and the wool breaks at the point of weakness; some in-lamb ewes look dishevelled because the foetuses rather than the fleece are grabbing the nutrients from the ewe’s food. There might be a shortage of good fleeces this year – as I write this, in May, there are even non-breeding ewes and hoggs that are trailing tatters of fleece; they’ve had a hungry, long winter and a late spring, and the new grass (what some Cumbrian hill-farmers call ‘Dr Green’) has been very late in coming..
It’s very sad that such a large proportion of our British-grown wool is now exported rather than being used here. A few years ago farmers were even burning Herdwick fleeces because it cost more to transport them to the British Wool Marketing Board than they were paid. The money has long been in the meat. Whether lambs are slaughtered for meat or reared to adulthood for breeding, the bigger the crop of lambs from the sheep-flock, the greater the profit for the farmer. Breeding programmes select rams and ewes for fertility and fecundity – twins are normal, and triplets, even quadruplets, are becoming common in the lowland sheep. But quality is important too. Meat-eaters want large fat-free loin chops or gigots for their Sunday roasts, so farmers also want to breed fast-growing lambs with big backsides. This is why ‘beautiful buttocks’ are ever more common, although a great deal hairier than those of Venus (http://en.wikipedia.org/wiki/Venus_Callipyge). Callipyge is one of three known genetic mutations in sheep that cause the muscles of the loin and pelvic regions to be very large. Unfortunately these big backsides can make for tough Sunday roasts – but the ‘double-muscle’ mutation in Texel sheep seems to be a winner. Texels, from the Netherlands and Belgium, are now a common breed in the UK. They have ugly faces and enormous backsides – indeed, I have occasionally seen Texels sitting upright on their haunches like dogs. But the animals have an interesting mutation in a gene that normally codes for a protein that inhibits muscle growth. The mutation blocks production of the protein, so that muscle growth isn’t inhibited at the appropriate developmental stage: more muscle fibres (rather than thicker fibres, hence the ‘double-muscle mutation’) develop – and the Texel’s buttocks get bigger and meatier. ‘Beauty lies in the eye of the beholder.’ It depends what you want. But I now find myself eyeing up various breeds and thinking about the wrapping rather than the contents! Ann Lingard (Ann Lackie) and June Morris will be talking in this year’s Science Festival about the rare breeds of sheep, the Herdwicks and the North Ronaldsays, and their genes, on the morning of Saturday 7 September in Kirkwall Town Hall – where Ann will also display some of her woven rugs. For more about Herdwick sheep and the impact of the 2001 Foot-and-Mouth epidemic, read an extract from Ann’s novel The Embalmer’s Book of Recipes, and a follow-up article on pages 20-22 of the second issue of The Fire Crane, the magazine of new writing from Cumbria. 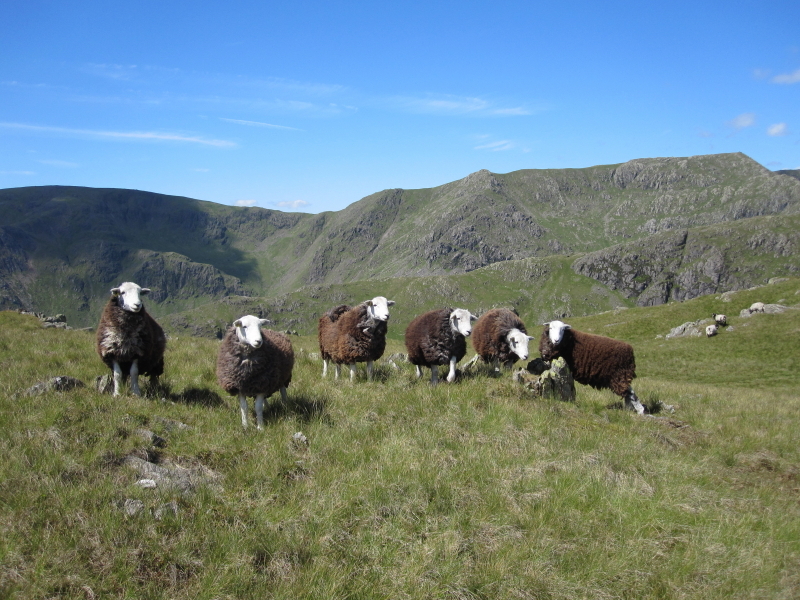 There is also a film, Hefted, about the Herdwick sheep of Cumbria, which shows how they – and the people with them – have a feeling of belonging to the landscape. 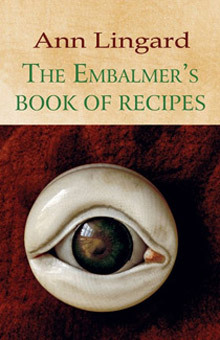 Ann Lingard (aka Ann Lackie), formerly a research scientist and academic at Glasgow University, is a novelist and writer of short stories and non-fiction. In additon to the ongoing Solway Shore Stories, her two most recent non-fiction projects have been at the ESRC Genomics Forum and the Department of Psychology in Edinburgh (see www.annlingard.com/writing). She lives on a small-holding, looking across the Firth towards the Dumfries and Galloway hills.